Fred Donald Marion (born January 2, 1959), is a former American college and professional football player who was a safety in the National Football League (NFL) for ten seasons during the 1980s and 1990s. Marion played college football for the University of Miami, and was recognized as an All-American. Marion played professionally for the NFL's New England Patriots. Marion was born in Gainesville, Florida. He attended the University of Miami in Coral Gables, Florida, where he played for the Miami Hurricanes football team from 1978 to 1981. As a senior in 1981, he was a consensus first-team All-American. 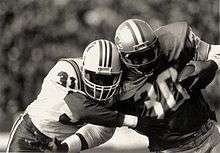 The New England Patriots selected Marion in the fifth round (112th pick overall) of the 1982 NFL Draft, and he played for Patriots from 1982 to 1991. He was a Pro Bowl selection in 1985 when he intercepted seven passes for 189 return yards, helping the Patriots to their first Super Bowl appearance versus the Chicago Bears. His only career touchdown came in 1986 against Pittsburgh. He intercepted Bubby Brister and ran back a 37-yard score.